Presentation Zen, by Garr Reynolds, has been my favorite business book in 2008. Whatever your field, if you are a professional, chances are that you are going to make a presentation at least once a year. If you are looking for guidance, you could do worse than checking Garr’s website, aptly named presentation zen, or buying the book. Garr’s book will not teach you everything you need to know about presentations, but is a great starting point. Focus on your delivering your message. Anything in your presentation that doesn’t help you deliver your key message must be removed. Conversely, there are ways to present your content that can enhance your message. Consider them. I could sum up his practical advice in 3 points. in your favorite presentation software, start from a blank slide. use visuals. And give your visuals all the space they need. The first thing most business professionals would do when asked to design a presentation would be to fire up Powerpoint and create slides. Then, they will edit slides. Insert slides… remove slides. Edit them some more. Tweak the design… Insert that extra idea. Ah, but the slide is no longer aligned. So we’re back to more editing and more tweaking. The end result is often busy, neither consistent nor convincing. Sounds familiar? 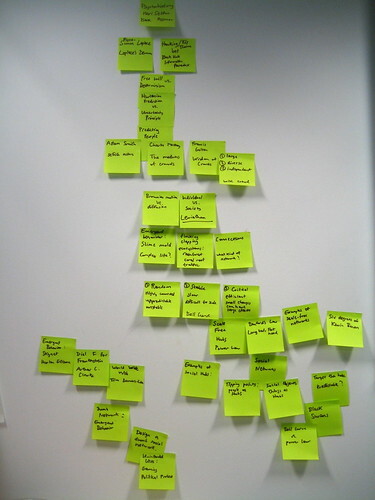 The solution to that problem is to start working on your presentation offline – determine the outline, how to structure your talk, what to say on each slide… A nice way to do this is with post-its. Post-its are easy to group and reposition, and if text doesn’t fit on a post it, it’s probably too wordy to put on a slide, anyway. Powerpoint and others have trained us to think in terms of bulleted lists. But what an awful way of presenting information! 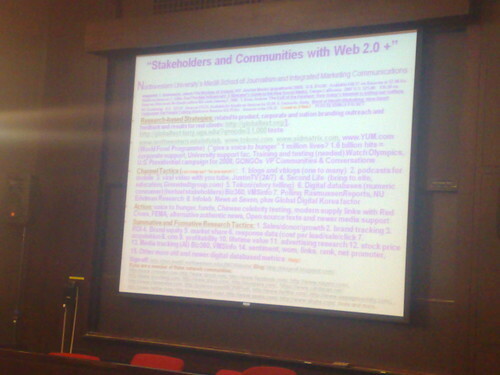 When you’re showing a bulleted list, you’re reading out loud your slide, to an audience who has alreay read it by the time you get to point 2. Garr, in this star wars-themed slide show, shows how bulleted lists are the “dark side of the force” type of presentations. Famous presenters each have their signature style, and Garr’s is the use of full-bleed image with minimal legends (and Gill Sans, but what’s wrong with that? I love Gill Sans). Full-bleed means that instead of integrating a smaller image in a template, you make it occupy all the space in the slide. I won’t claim this is the single best way of presenting information, and by the way, neither does he. But it is fool-proof and easy to emulate. Finding the right image, which has never been that easy, and using it appropriately, will always have great impact. In the book, Garr covers much more ground. It’s not only interesting, but it’s a nice read, and laced with examples you can actually use. I was quite surprised to see him redo charts I had done! (although, for my defense, they were never intended to be shown as is in a powerpoint). If you need to buy one book on presentations, buy this book. If you think you don’t need a book on presentation, buy this book as well. PS. Since the book has been released, I can see lots of presentations, on slideshare or elsewhere, that apply the visual style of Garr’s (nice, appropriately-chosen images, caption kept to an essential) but forget the other part of the story, which is the structure of the overall presentation. Both aspects are vital and complementary.